Following the enormous success of “The Lone Ranger” on radio in 1933, the editors at King Features decided to adapt Fran Striker’s hit program into a comic strip which began on Sept. 10, 1938. It was first drawn by Ed Kressy who was replaced by Charles Flanders (1907-1973) in 1939. Flanders stayed with the strip until it ended in December ‘71. Dell began reprinting the strips with Dell’s large FEATURE COMIC #3 in ‘39, followed by 10 more FEATURE COMIC or FOUR COLOR issues through ‘47. Reprints of the newspaper strips also soon appeared in ACE, FUTURE COMICS, KING COMICS and MAGIC COMICS. Then, as of Jan./Feb. 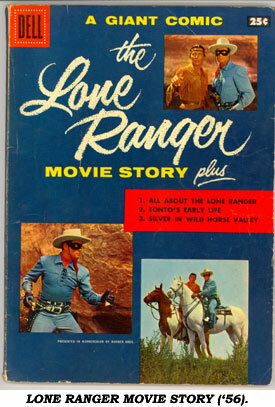 ‘48, Dell began their long running LONE RANGER comic book. #1-37 were again daily and Sunday newspaper strip reprints published in no particular chronological order. With #38 original stories began to appear, written by the prolific Paul S. Newman (1924-1999). It was at this time the Ranger’s previously red shirt became blue. 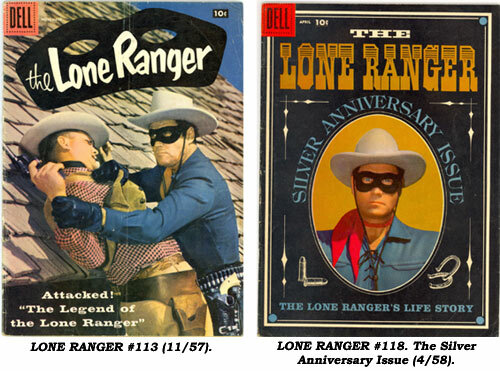 Newman was very careful not to tamper with the Lone Ranger legend, incorporating all of the characters from both the newspaper strip and the radio program into his stories. 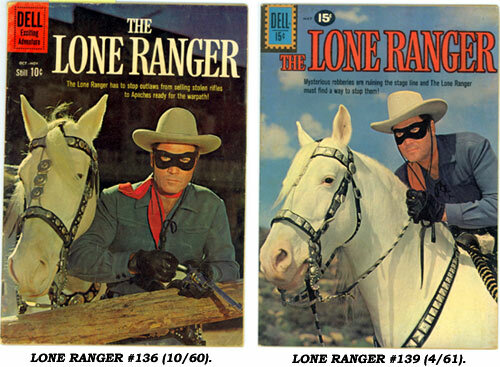 Newman milked every western plot cliché possible until the comic book eventually ran its course and ended with #145, by then demoted from a monthly to a quarterly, in May/July ‘62. Newman was so good at handling the Lone Ranger that he took over writing the newspaper strip after originator Fran Striker departed. Tom Gill (1913-2005), a solid artist, drew most of the stories from #38-145, although there was occasional work by Jim Christiansen (‘27- ) and Herb Trimpe (‘39- ). 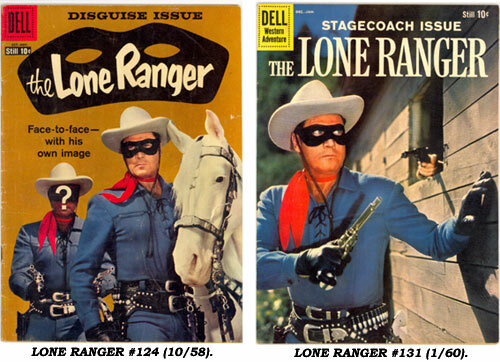 The most desirable issues to collectors began with #112 (10/57) when Dell made the switch from art covers to fabulous action oriented photo covers featuring Clayton Moore—a few even adding Silver to the mix (#112, #123, #124, #126, #127, #136, #138, #139, #141, #144). The photo covers lasted til the end came with #145. Originally monthly, with #124 the comic switched to bi-monthly in Oct./Nov. ‘58, with the last issue being, as noted, a quarterly, but obviously Dell decided sales were not strong enough to keep the comic going. In Fine #112-145 range from $50 to $30@, except for #118—a special origin Silver Anniversary issue—at $66. Later, Gold Key published #1-28 (mostly reprints) from ‘64-‘77. 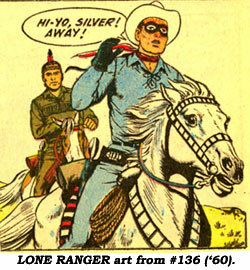 There were also 33 issues of TONTO from ‘51-‘59 and 36 issues of HI-YO SILVER from ‘52-‘60, both from Dell. 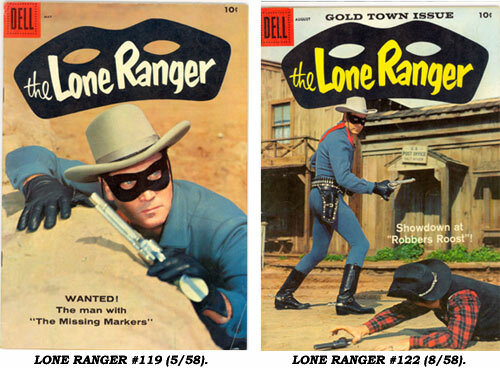 There’s also Dell’s GOLDEN COMICS DIGEST, 10 issues of Dell’s MARCH OF COMICS, three issues of LONE RANGER’S WESTERN TREASURY annual in ‘53, ‘54, ‘55, and, most importantly, Dell’s Giant LONE RANGER MOVIE STORY in March ‘56 which adapted “The Lone Ranger” WB film to comics. The special featured front and back cover photos, even an inside back cover photo and text about filming of the LR movie. This issue books at $108 in Fine in OVERSTREET’S PRICE GUIDE. Later, Topps published a limited four issue series in ‘94, then there’s the ongoing recent Dynamite Comics series. 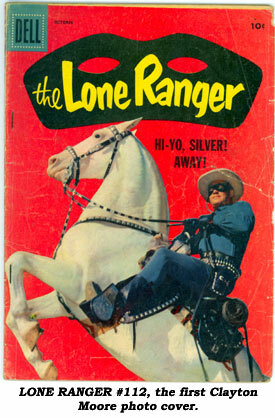 All in all, there’s plenty of Lone Ranger comic book action to be found!